Most advisors considering XYPN membership have one main question: What's in it for me? From personalized business coaching to countless marketing resources to a tech stack that seems too good to be true, there are many perks of being an XYPN member, all with one thing in common: XYPN's membership benefits and discounts are specifically designed to help financial advisors of all stages succeed. 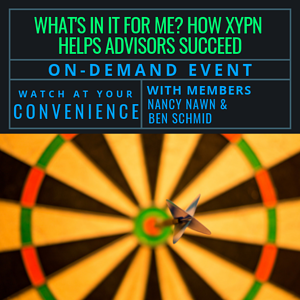 XYPN members Nancy Nawn and Ben Schmid discuss how XYPN has helped them as financial advisors and explore how and why their membership has more than paid for itself. Study Groups: Because You Can't Go It Alone... And You Shouldn't Have To! Ben Schmid is the founder of Ketwich Capital LLC ("Ket-Cap"), which serves the financial and investment needs of professionals and families in urban cities. Ben's passion for investing began when he bought his first mutual fund at age eleven. Prior to Ket-Cap, Ben spent a decade working on Wall Street. As an equity analyst at UBS in 2008, he had a front-row seat to the housing bubble burst and the collapse of the global economy. This experience taught him the dangers of financial salesmanship and how a clear financial plan is vital during difficult times. Throughout his career, Ben has felt called to greater stewardship of capital and has become a fierce advocate of fiduciary standards. Raised by a single mom with two other siblings, Nancy Nawn, CFP®, CIMA®, learned the value and importance of sound financial management at an early age. Nancy ultimately wanted to become a financial planner to help other people understand and manage their financial lives. Through her firm WatchDog Planning, Nancy has helped hundreds of individuals, families and small businesses create strategic roadmaps leading to personal and professional success. Her practice is now focused specifically on women who have historically been underserved by the financial planning community.